You've now added Daintree Discovery Tours to your itinerary. Spend the 28th (Sun) among aquatic life with a scuba or snorkeling tour. Spend the 30th (Tue) spotting exotic species with a safari tour. The adventure continues: relax and rejuvenate at some of the top local wellness centers. To find ratings, photos, maps, and more tourist information, refer to the Port Douglas trip planning website . Naha, Japan to Port Douglas is an approximately 15-hour combination of flight and shuttle. Due to the time zone difference, you'll lose 1 hour traveling from Naha to Port Douglas. Expect somewhat warmer weather when traveling from Naha in April: highs in Port Douglas hover around 34°C, while lows dip to 25°C. You'll set off for Sydney on the 1st (Wed). Leura is a suburb in the City of Blue Mountains local government area that is located west of the Sydney central business district in New South Wales, Australia. On the 2nd (Thu), take some stellar pictures from Govetts Leap, admire the sheer force of Wentworth Falls, explore the world behind art at Norman Lindsay Gallery & Museum, admire the natural beauty at Everglades Historic House and Gardens, then take some stellar pictures from Elysian Rock Lookout, and finally don't miss a visit to Echo Point Lookout. Get ready for a full day of sightseeing on the next day: stroll through The Giant Stairway, scramble along the landscape with a canyoning and rapelling tour, and then don't miss a visit to Day FIne Art. To see ratings, reviews, other places to visit, and tourist information, refer to the Leura trip itinerary planning website . Do a combination of shuttle, flight, and train from Port Douglas to Leura in 8.5 hours. Alternatively, you can drive; or take a train. Traveling from Port Douglas in May, expect nights in Leura to be colder, around 8°C, while days are little chillier, around 24°C. Finish your sightseeing early on the 3rd (Fri) so you can drive to Sydney. Sydney is known for nightlife, trails, beaches, parks, and museums. 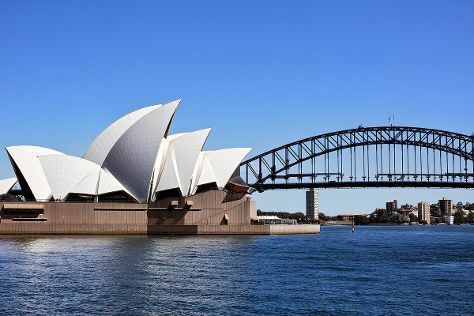 Your plan includes some of its best attractions: take in nature's colorful creations at Royal Botanic Garden Sydney, take a stroll through The Rocks, admire the striking features of Sydney Opera House, and appreciate the history behind Mrs Macquarie's Chair. To see where to stay, maps, and tourist information, you can read our Sydney vacation builder site . You can do a combination of shuttle and flight from Port Douglas to Sydney in 7 hours. Alternatively, you can drive; or do a combination of bus and train. Prepare for a bit cooler weather when traveling from Port Douglas in May: high temperatures in Sydney hover around 24°C and lows are around 14°C. You will leave for home on the 4th (Sat).